When some people fly, they bring along lots of heavy baggage-literally and emotionally. On any given flight, there's probably more than one white-knuckle flyer, people en route to potentially life-changing job interviews or business meetings, and still others traveling for funerals or other sad events. Overstimulated children and weary seniors can also be particularly vulnerable. Whatever the reason for passengers' stress (and there are plenty), a growing number of airports are using therapy animals to help lighten their emotion load. Handlers patrol terminals and concourses with adorable Pugs, Labradors, Shepherds and other furry envoys, encouraging travelers to pet, nuzzle and play with their specially trained pooches. About 50 airports throughout North America provide therapy animals to help comfort stressed-out travelers, and countless others have programs in the works. The Alliance of Therapy Dogs, a volunteer-driven organization based in Cheyenne, WY, is involved with most of the existing programs (more than 40 out of 50). "The program is growing by leaps and bounds," reports the organization's executive director, Billie Smith. "With large airports, they're more in competition with each other. Anything they can do to make travel easier for their customers, they're going to do." Unexpected Benefit: Teams promote the airport at local schools, parades, festivals, etc. Like charging stations, nap areas and upscale shopping, therapy animal programs are becoming a sought-after customer amenity. That said, Smith notes that not all therapy dogs are suited to work in airports, because they have far more stimuli than the animals encounter in other places they work such as hospitals, schools and senior centers. "The person taking their dog to the airport must understand that and must be totally and completely comfortable with the large crowds, the rushing and hustling, baggage, different people of all sizes, shapes and colors," Smith cautions. "They have to really be comfortable in their own fur to take them into this program." With this in mind, the Alliance provides tests and observation services to help handlers determine which venues are best for them and their dogs. Smith strongly advises airports organizing a therapy program to choose dogs of moderate age. Younger dogs can be easily overly stimulated by airport settings, and older dogs can struggle with the amount of walking required and the general physical demands of one- to two-hour shifts. "Airport personnel are pretty aware of what they're looking for, so they set up their programs wisely in requiring one to two years of therapy dog experience," Smith observes. "This is especially hard for older dogs, but every dog ages differently just like every human ages differently. We leave it up to our members to have common sense." To address liability concerns, many therapy program organizations carry insurance for the animals they supply to airports. The Alliance of Therapy Dogs, for instance, carries $5 million worth of coverage. 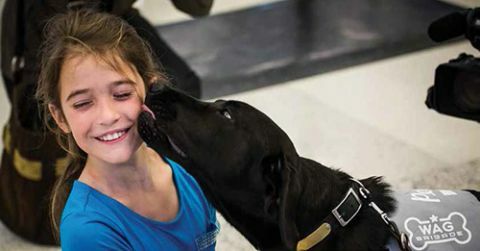 Charlotte-Douglas International Airport (CLT) in North Carolina is one of the many U.S. airports using man's best friend to provide passengers with a little extra comfort. The Alliance of Therapy Dogs helped the airport launch its CLT Canine Crew in March 2015. Lauri Golden, CLT's manager of customer engagement, brought the idea home from a Customer Experience Symposium presented by the American Association of Airport Executives. Armed with guidance from The Alliance of Therapy Dogs, the airport outfitted its volunteer teams with uniforms to make them instantly recognizable to travelers. Vests for the dogs are emblazoned with "Pet Me!" and the owners wear coordinating shirts. Because 80% of CLT's business stems from connecting flights, the airport dispatches its therapy dogs after TSA security checkpoints. This allows customers to get the most of their experience at CLT before moving on to their next destination, explains Golden. One benefit she didn't expect is the extra exposure the program provides for the airport. Handler/animal teams from the CLT Canine Crew act as good will ambassadors when they appear at parades, festivals and community events. They've even gone to local schools during exam weeks and accepted invitations from local churches for special animal blessings. Costs to launch and maintain the program have been minimal, reports Golden. The handlers volunteer their time, and the airport pays for the uniforms. After starting with seven teams, the CLT Canine Crew is now up to 15 teams; and three others are working their way through the application and training process. As the program continues to grow, the airport plans to dedicate staff to "groom it" to its full potential, notes Golden. In a related matter, CLT added two indoor pet relief areas last year. "Our canine customers as well as our own Canine Crew get to take advantage of this amenity conveniently located in the terminal," she relates. Although San Francisco International (SFO) was not the first airport to establish a therapy animal program, it is the first (and still only) to welcome a pig to its roster. LiLou, a city-raised Julianna pig, joined the airport's Wag Brigade this past December. Not surprisingly, she has garnered worldwide attention for the busy hub. Doug Yakel, public information officer for SFO, considers LiLou and the rest of the Wag Brigade examples of the airport's ongoing focus to develop a set of amenities that allows airport visitors to customize their experience. 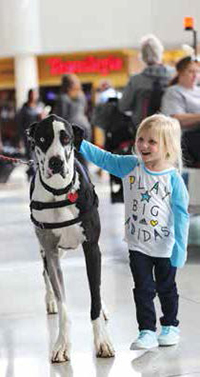 With credentials as a certified therapy animal and previous experience visiting senior centers and hospitals, LiLou fit right into the airport's three-year-old program. Actually, she quickly became a star. Along with a traditional therapy animal vest, LiLou often sports a variety of festive outfits: a cupid's costume for Valentine's Day, a tutu when she's feeling frilly and an airline captain's hat for, well, fashion's sake. If that wasn't enough, she is also an entertainer. LiLou can twirl and stand up on her hind hooves, play a toy piano, run in a figure "8" and push a ball with her snout. Needless to say, travelers perk right up when they see SFO's prize pig. "The dog program is unique, but the sight of a pig wearing cute costumes is like having an A-list celebrity walking through the airport," Yakel comments. "LiLou cannot get more than 10 or 20 feet without being surrounded by people for selfies. The reaction has really been amazing." To help patrons connect with therapy animals, SFO promotes the specific locations where teams can be found during their weekday shifts. Although large airports like SFO and CLT are arguably more stressful for passengers, pet lover Tara Hernandez instinctively knew that dog therapy programs can also have a profound effect at smaller airports like Gerald R. Ford International (GRR) in Grand Rapids, MI. As marketing and communications director at GRR, Hernandez spearheaded the Gentle Fur in Action program in October 2013 after reading about a similar initiative at Los Angeles International. The airport partnered with West Michigan Therapy Dogs to establish the program, and Hernandez keeps it on a short leash, so to speak, by occasionally joining the dog/handler teams as they mingle with passengers at Baggage Claim, in gate areas and throughout the concourses. After more than three years in operation, the program has reaped more benefits than even Hernandez expected. One memorable example occurred early in the program's history, when Gunner, one of the original canine recruits, disobeyed his handler's orders and insisted on approaching a woman walking out of the terminal and into a parking area. When Gunner tapped the woman with his nose, his handler began to apologize for his uncharacteristic disobedience but stopped when she realized the woman was sobbing. Turns out that Gunner knew exactly what he was doing. The woman had just left her son, who had boarded a plane to serve in Afghanistan; and she really needed some comfort. Instead of hurrying off to her car, the woman pet Gunner and spoke with his handler for about 30 minutes. By the end of their conversation, she was much calmer and relieved to have had a therapy dog available during such a trying time. "My husband served 14 years in the Marine Corps, so I'm not surprised Gunner had the sense to recognize from a distance she was troubled and to sit there for her," Hernandez comments. On its website, GRR encourages customers anticipating stressful journeys to plan ahead and request time with one of its therapy dogs. "Due to schedules, we cannot accommodate all requests, but we will do our best. And we have no shortage of wiggly tails or wet noses," notes Hernandez. Currently, the program has 11 teams. She also notes that the dogs aren't just for patrons; they also provide much-needed comfort to airport and airline employees. Hernandez recalls Chamois, another veteran of the Gentle Fur program, touching the heart of an airline crewmember passing through GRR in January. When the flight attendant saw the Golden Retriever walking through the terminal with his handler and Hernandez, she dropped her things and ran to them, throwing her arms around the dog. The flight attendant had put down her own Golden Retriever just two weeks earlier, and the sight of Chamois at the airport flooded her with memories-and more than a few tears.